Hi-hi-hi XXXX -- and doesn't it feel like springtime might be here soon? Yipppeee!!! Is what I say to that. So how about some drive-away-dull-care spring-filled FiddleBop jazz-swing-with-that-gypsy-zing tonight? Yep, I said TONIGHT!!! That's 9 pm on Friday 12 Feb 2016, at the White Horse, Banbury Cross (50-52 North Bar Street, Banbury, Oxon OX16 0TH). And we're not talking about just any old FiddleBop gig, it's our Valentine's Day Special! (A little bit early, but who amongst us can wait when it comes to passion? 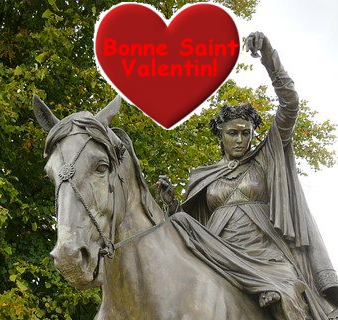 Don't answer that...) For your taste of La Saint-Valentin en Banbury, come along to the White Horse this evening. With landlord Ken as Cupid, and FiddleBop providing music for romance a la gypsy jazz, dare you miss it? And we've plenty more FiddleBop for you during 2016! The gig list is filling daily, and so there will be more to come in future newsletters. But for now, how about trotting along to a new venue (for us): Theoc House Café-Bar in Tewkesbury (85 Barton St, Tewkesbury, Glos GL20 5PY)? FiddleBop will be making these friendly walls ring with hot-hot-hot gypsy swing, from 8.15 pm Wednesday 30 March 2016. Further south, we've another new (for us) venue on Sunday 10 April 2016, from 8 pm. This is The Trout Inn, Lechlade (St John's Bridge, Faringdon Road, Lechlade, Glos GL7 3HA) which is an awesomely pretty pub, situated by the first lock of the River Thames, no less. We can't wait! And on Sunday 17 April 2016, from 5 pm, we return to a favourite of ours: The Nag's Head On The Thames, Abingdon (The Bridge, Abingdon, Oxon OX14 3HX). I dunno about FiddleBop's affinity for river water, but this gig is not just by the Thames, it is actually on the river, on Nag's Island. So if you want to shiver (with delight, that is) as you oughter, to the sound of jazz and flowing water: see you at the Nag's? The last FiddleBop gig which I'll mention in this newsletter is another new venue for us, altho' it is only just down the road for myself, Jo and Roger: The Sun Inn, Hook Norton (High Street, Hook Norton, Oxon OX15 5NH) on Friday 29 April 2016, from 8 pm. Fine food and fine beer here folks (well, being a mere stone's thrown from Hook Norton Brewery, how it could it be otherwise?) 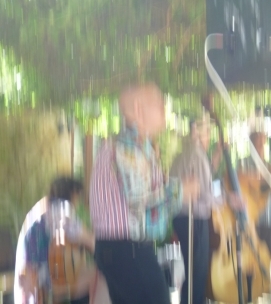 So we'll provide the uber-melodious gypsy jazz swing, and an uber-memorable time will be had by all! That's all for now. Better get ready for that gig. Another FiddleBop newsletter will make the cyberspace rounds in a few weeks. 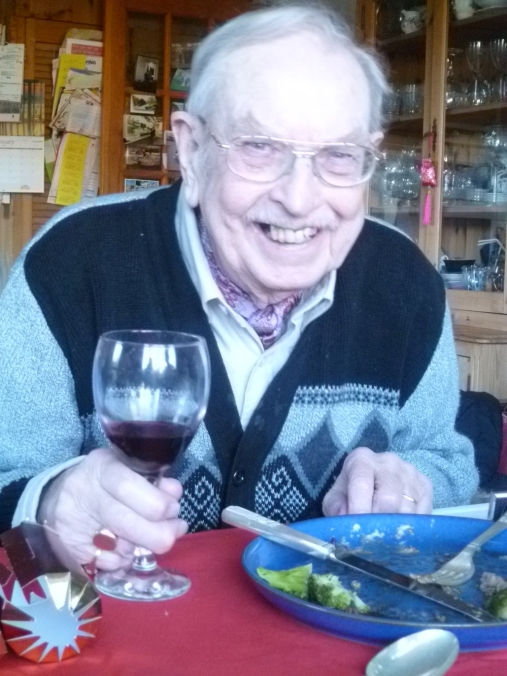 Till then, one last thing: I'd like to dedicate this FiddleBop newsletter to my Dad: to Ron Mortlock (28 June 1927 – 2 September 2015) who had to listen to me making 'orrible sounds on the fiddle when I was fifteen years old. Poor man. Here he is, enjoying a glass or two, as was his wont. All the best, Dad! And all the best to you XXXX, and hopefully see you soon! PS if you really want to know the sources of these quotes, then Google is your friend... Or you could ask me.